Little girl updos have gone quite a long way from how it was a few years back. 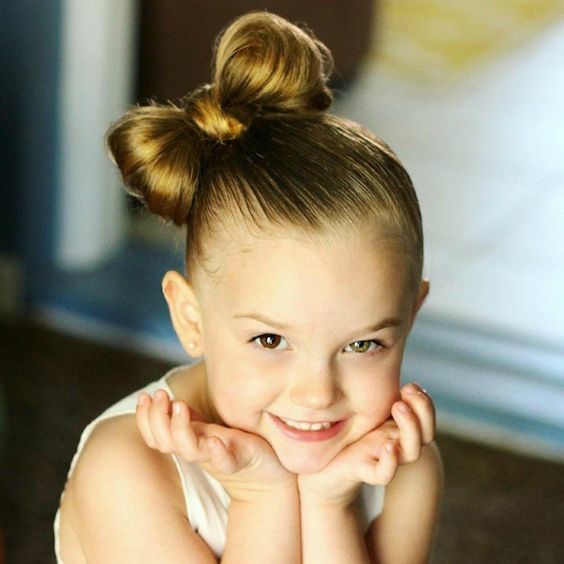 There used to be a lot of teased hair and hairspray involved from what we can recall back then. 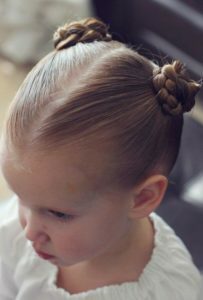 Now, most little girl updos are age appropriate and don’t require a lot of chemicals in the process. 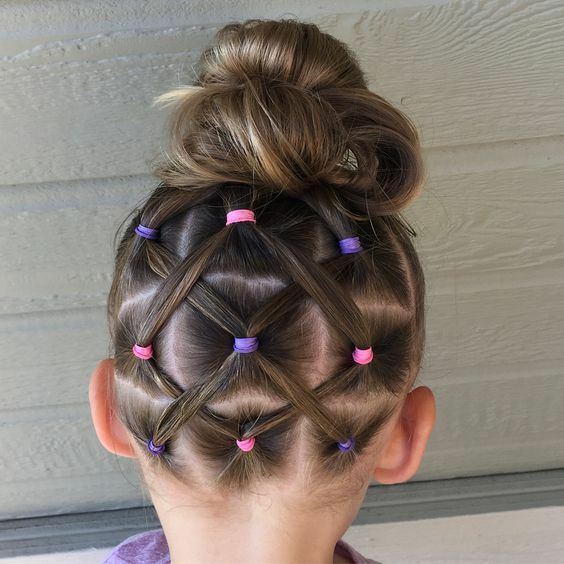 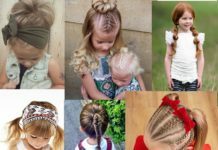 Here are little girl updos that might just spark your interest! 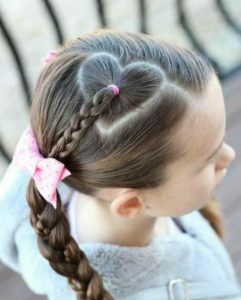 This pretty ponytail is achieved by shaping out the heart shape first and securing it as a normal ponytail. 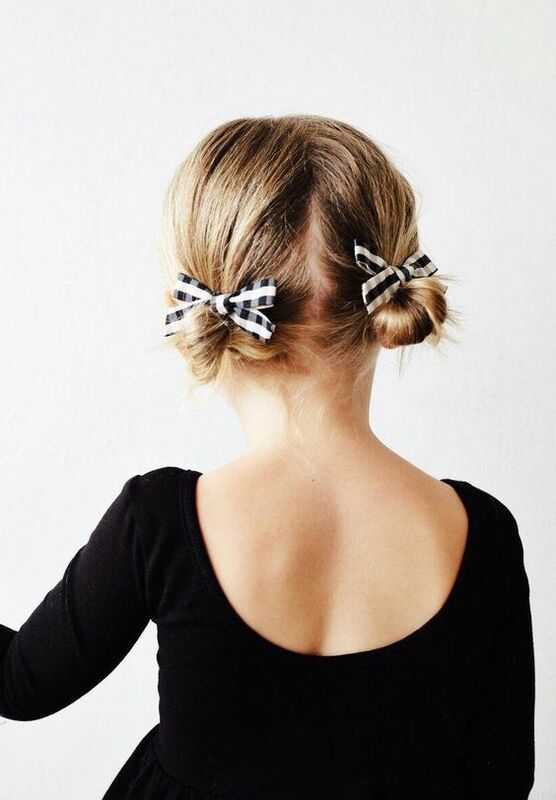 With the use of a topsy tail hairstyler, pull your ponytail through. 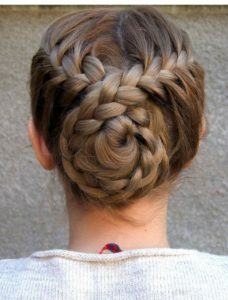 You then french braid the rest of the hair on the side, and secure it at the bottom. 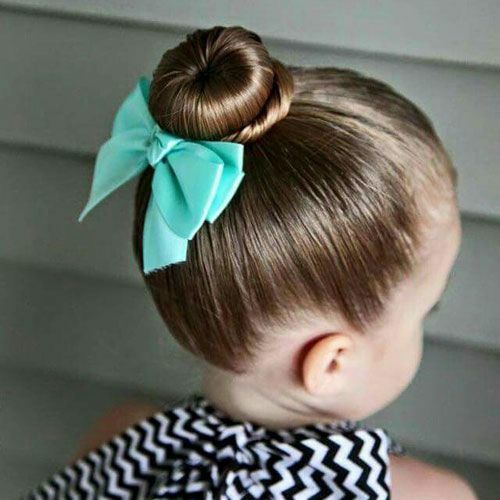 This adorabl high ballerina buncan easily be done with a hair sock. 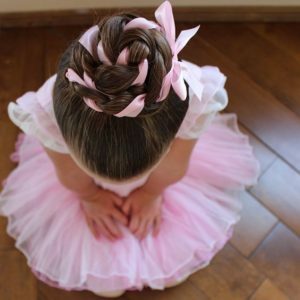 Once the hair is secured around the sock with an elastic, gather the remaining hair and twist it around the bun to hide the elastic. 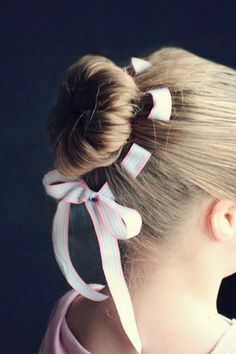 Seal it with a sweet bow either on the bottom or on the side. 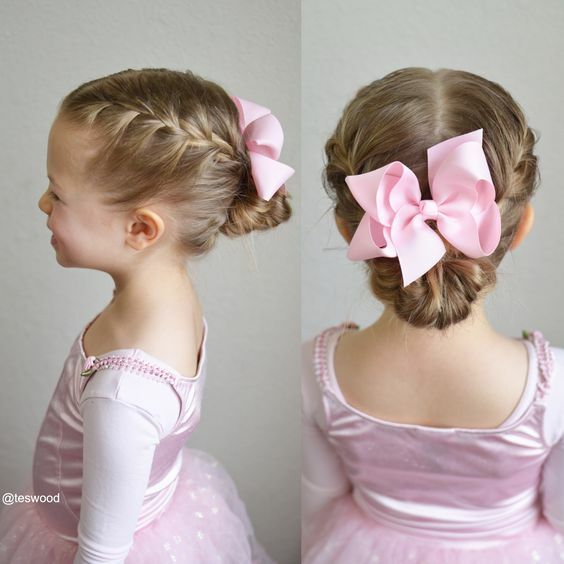 This adorable updo suits this little girl’s curly hair. Utilizing a reverse braid is a better option as it creates more texture, rather than just doing a regular french braid. 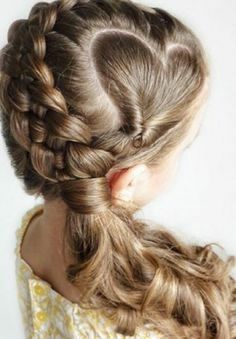 In this braided style, two reverse French braids are weaved with a ribbon through the hair and secured in a ponytail. Little girls and bows go together like peanutbutter and jelly. 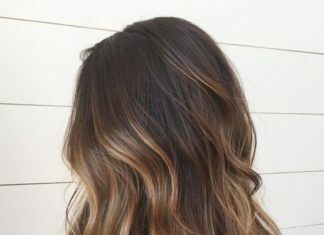 You cannot find a better combination than this, and you can never go wrong with it! If your little lady has long hair, this would just be perfect. To achieve this, gather your child’s hair to one side and tie it into a ponytail, BUT remember not to pull all the way through on the last round. 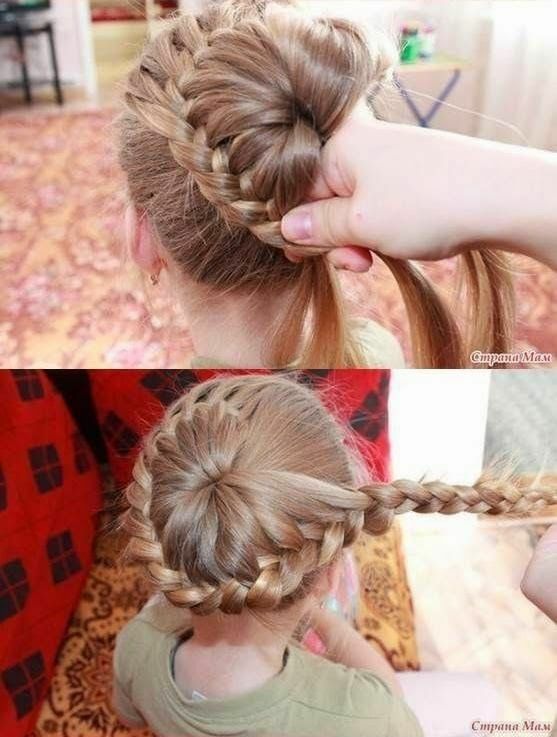 This will give you a loop. 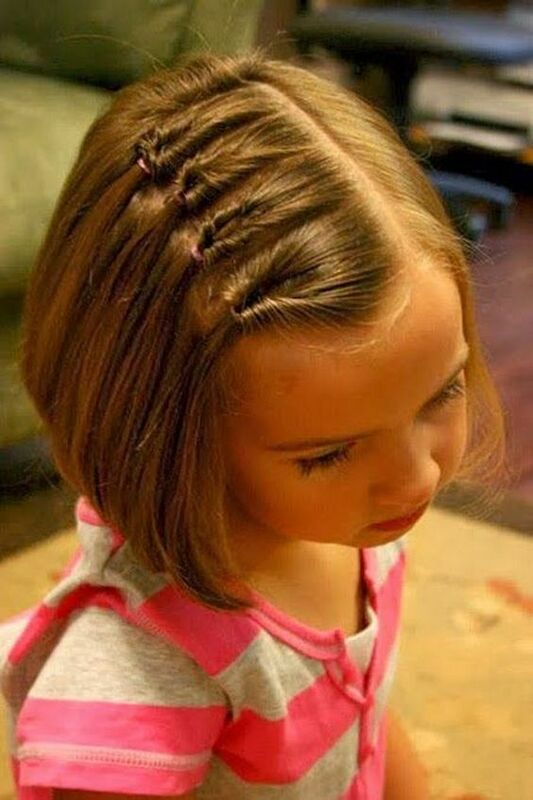 Separate the loop into two parts, and with the remaining hair, place it in between the two loops to create a center part. 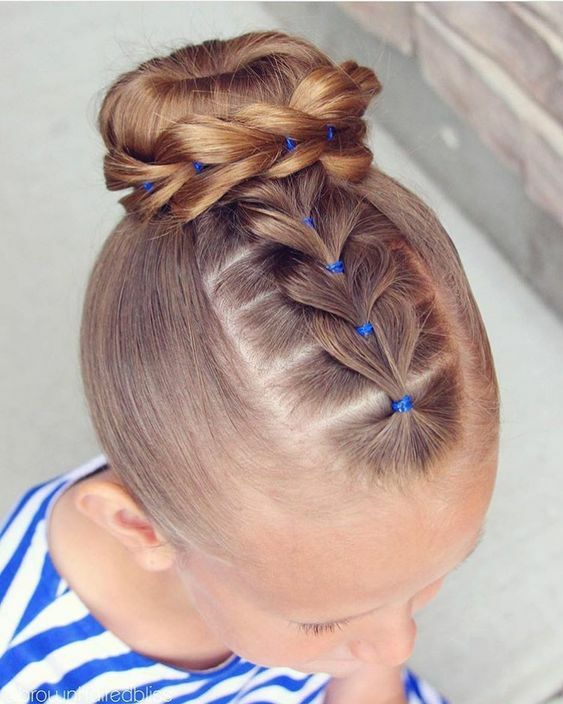 Pin everything securely, and you are done! 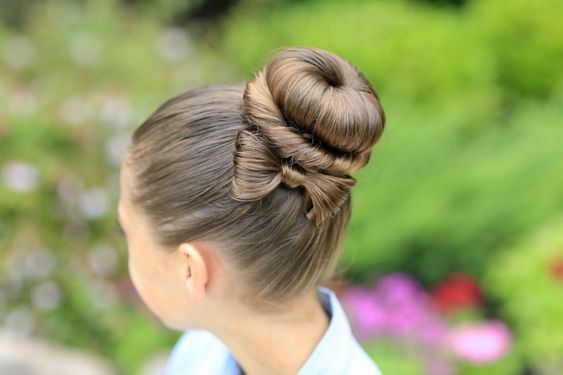 To create this chignon updo, place the crown, and loop the hair around it. 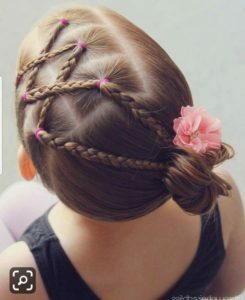 You have the option of looping from the top, or you can just loop the bottom part. 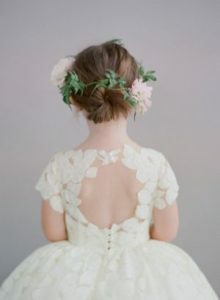 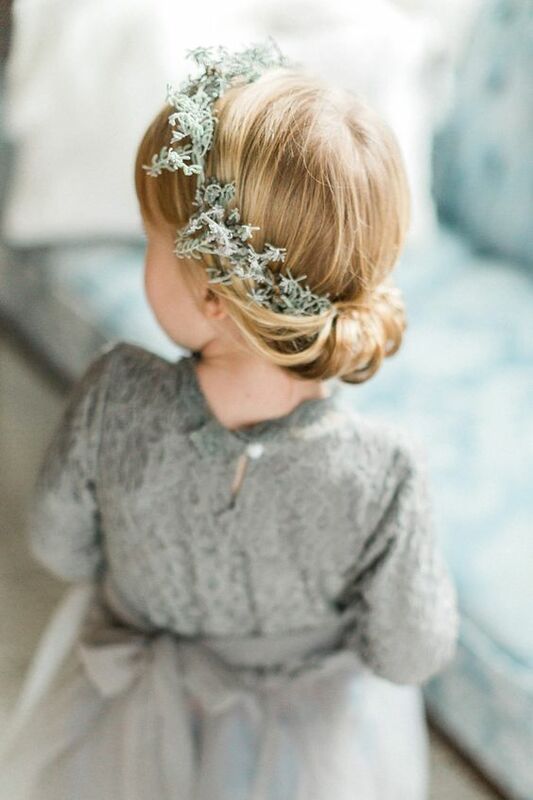 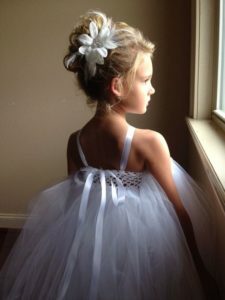 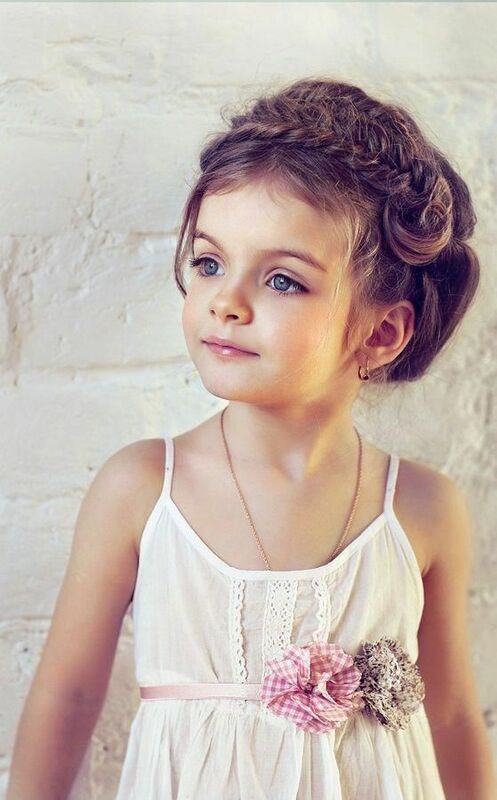 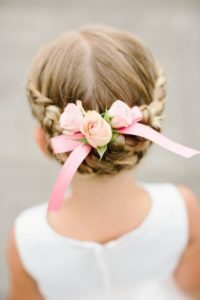 It’s a really cute updo and can be used for flower girls at weddings. 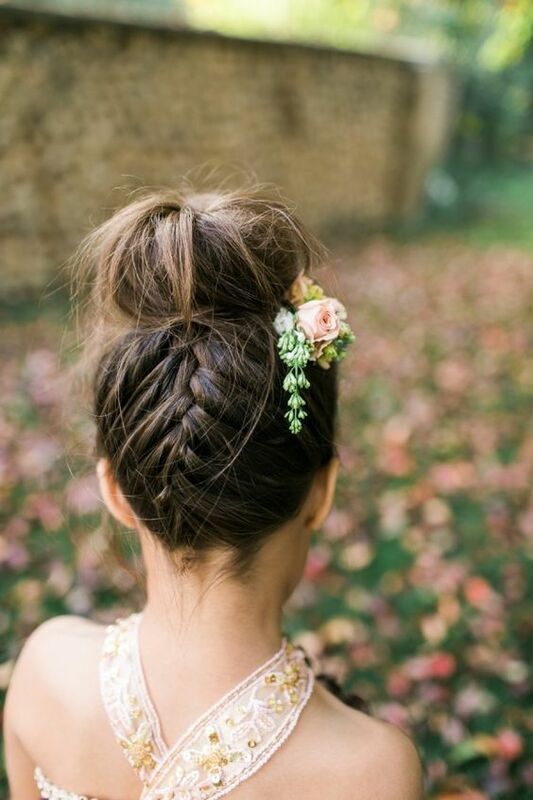 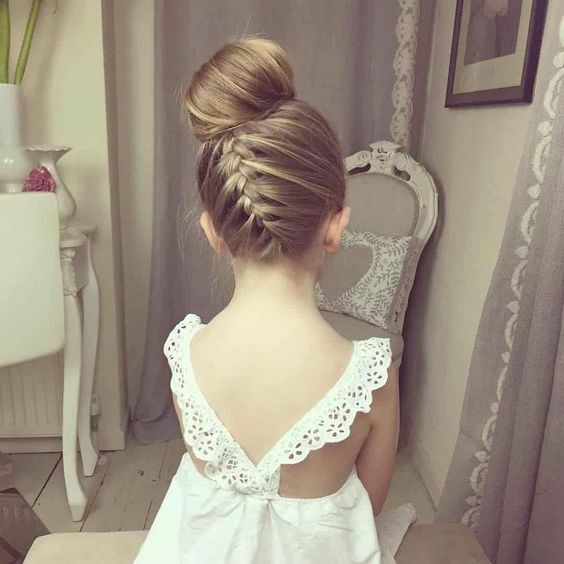 This updo is so adorable! It is recommended to do the braid first and once you are halfway through, tie everything together and make a simple messy bun. 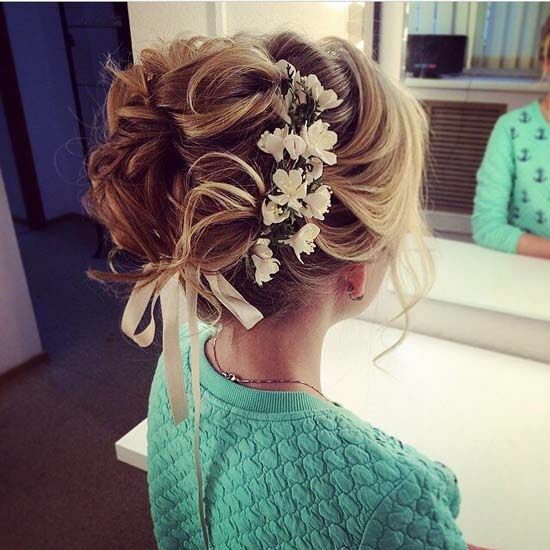 This updo may need the use of extensions to achieve. 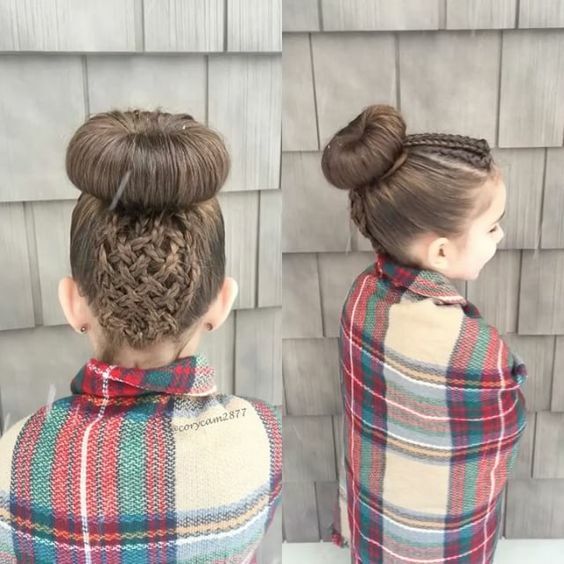 Use your girl’s hair for the bun. 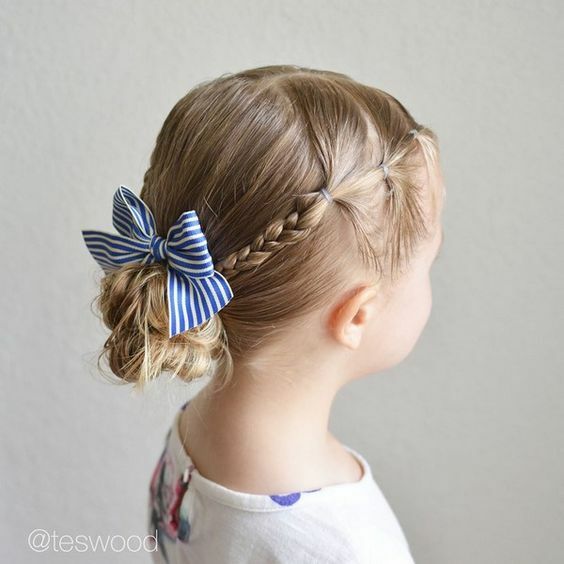 The twisted hair and hair bow can be accomplished by using extensions. 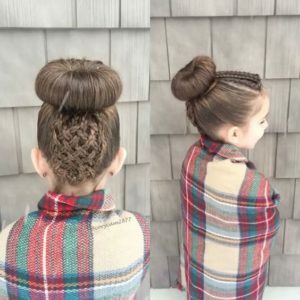 This amazing updo involves making several small braids both at the bottom and at the top and weaving them in a basket style. Once you are halfway through, collect all the ends and make a sock bun. Here’s a sweet simple hairstyle that any mom can do. 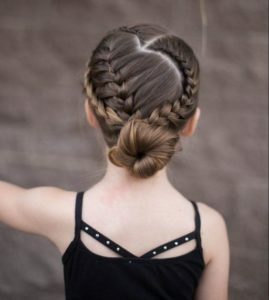 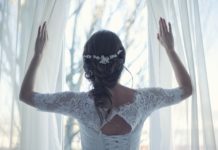 Make two connected ponytails on each side of her hair and braid the rest, gathering everything into a bun at the bottom and securing with a bow. This Roman style braided updo looks really cute and romantic. 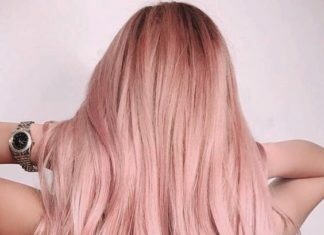 It is just a simple loose reverse braid from one side of the head to the other. 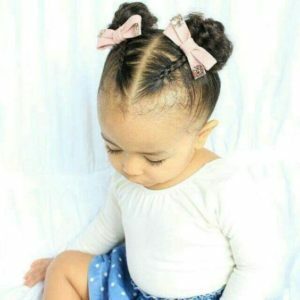 Pigtails look adorable on little girls! This hairstyle is a well-known and well-loved classic involving two braided pigtails twisted into a bun. 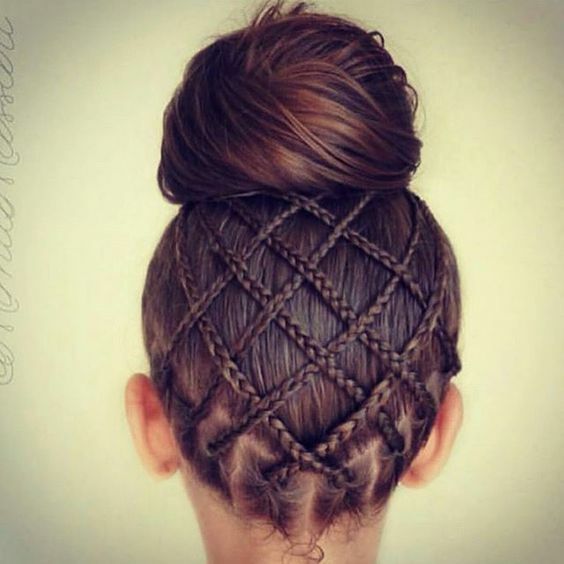 This is a really creative way to upgrade your everyday bun! 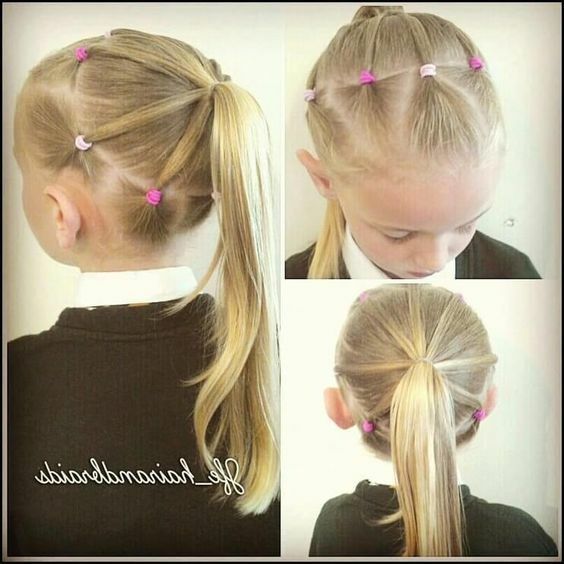 Gather your girl’s hair into a ponytail, leaving behind around 1/4 patch on the upper left side. 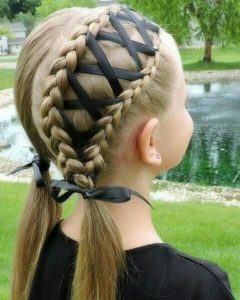 You then insert a hair bun, and French braid the first part together with the remaining patch, and braid the rest of the hair through. 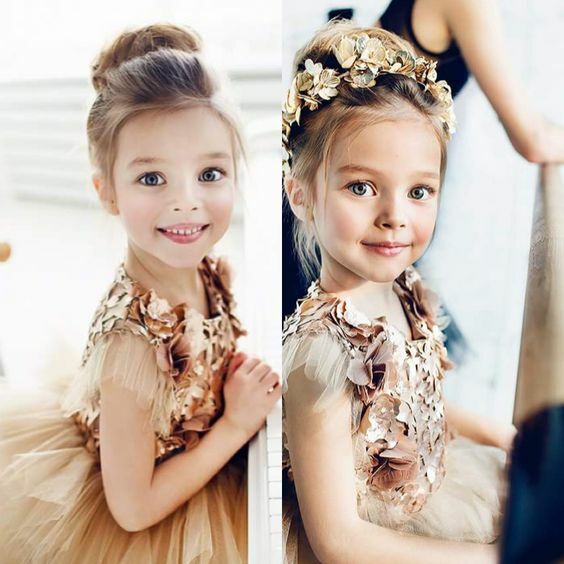 Such an adorable little flower girl! 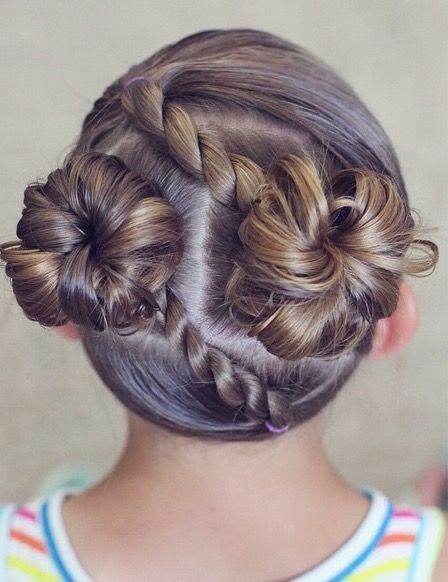 Depending on the amount of hair that your girl has, you can find hair buns in varying sizes. 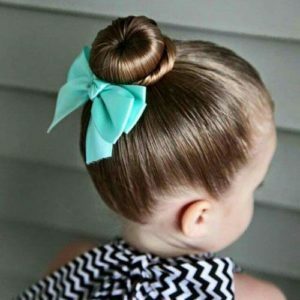 If you would like to have a bigger bun, use a bigger hair bun of the same color as your child’s hair. To achieve this look divide the hair into three parts in the shape of a heart. Then create a French braid at the bottom, and gather everything into a low bun. We are sure your little girl will love this really cool updo! 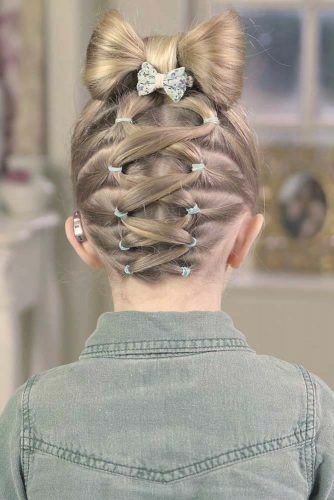 Unlike the corset braid that involves, this is just a matter of making connected ponytails in a corset fashion and ending with a hair bow on top. 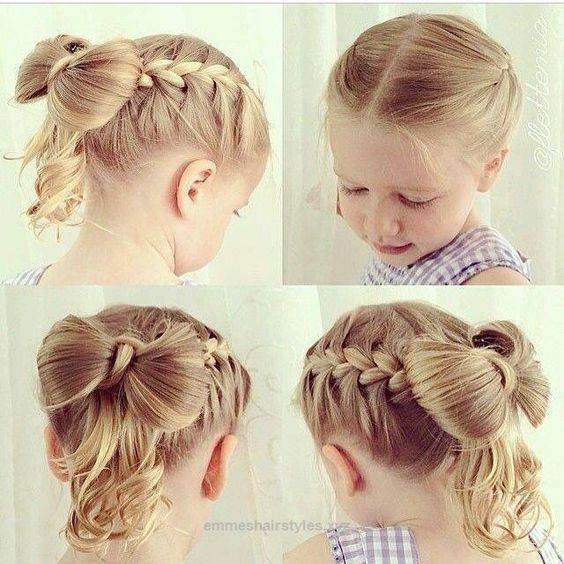 What a cute and sweet hairstyle for girl. Create 2 tiny ponytails and braid them until you get to the point where you want your second set of ponytails to be. 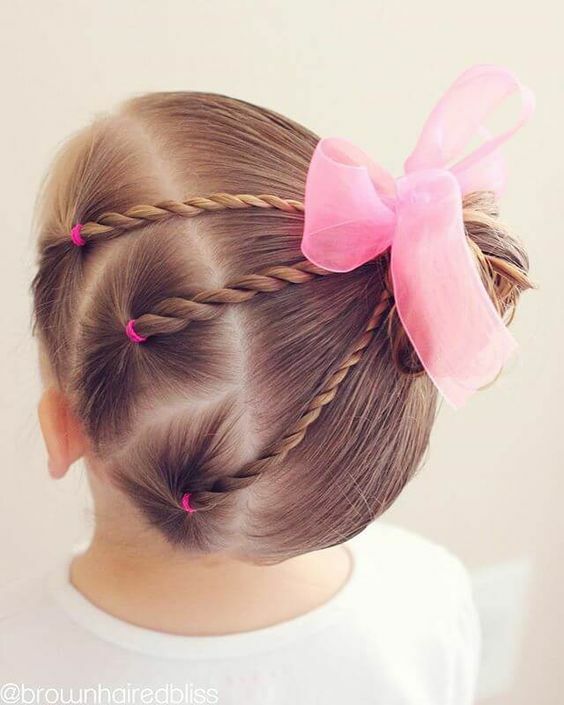 Cross the two braids and secure them into two ponytails and finally, braid the ends toward one last ponytail and tie with a ribbon! 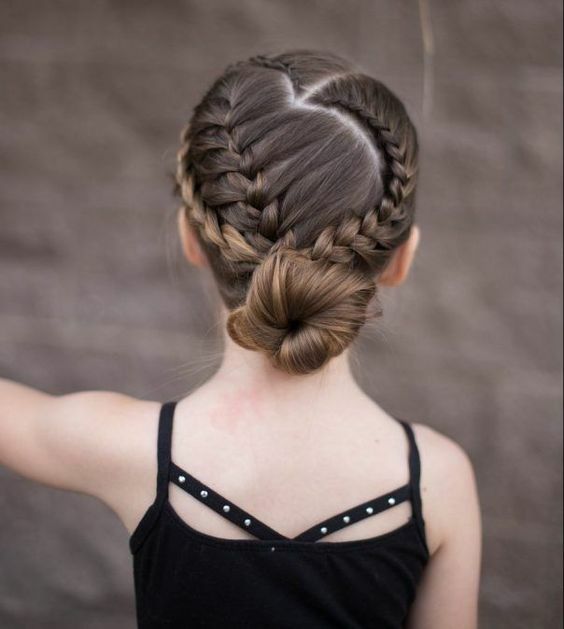 Sometimes, simplest is best, much like this double French braid where you stop midway and gather everything to a ponytail. 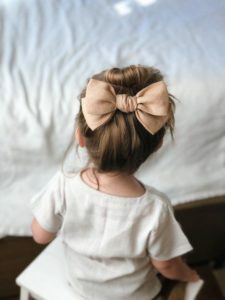 You have the option of leaving it in a ponytail, or you can make a bun, and tie it with a pretty bow. 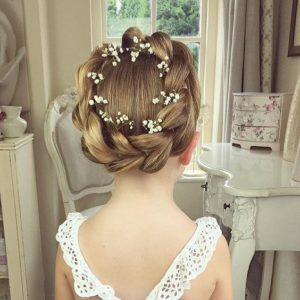 As you can see, when it comes to little girls updos, the options are endless! 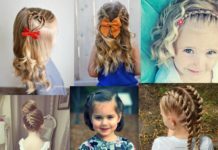 In order to achieve the best effect for the styles posted, it is important to take into consideration the type of hair your child has. For example, the aforementioned hair bow would work well with straight hair, but if your child has curly or wavy hair, it might not have the same effect. 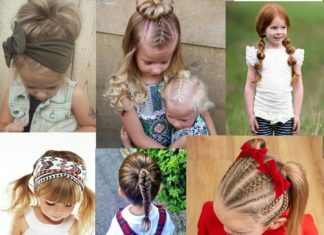 As with everyone else, little girls’ hair differ in type and texture. 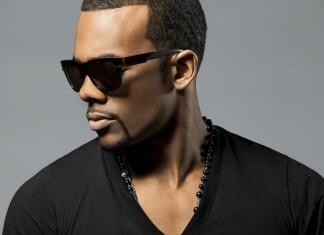 We advise on minimal use of chemicals on their hair as they are quite young, as well as to preserve their hair’s health. 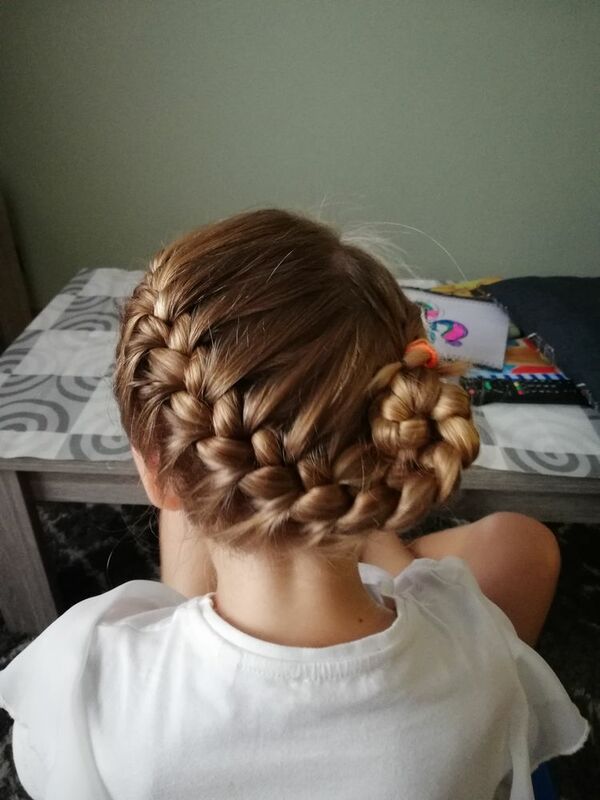 Try to go as natural as possible. 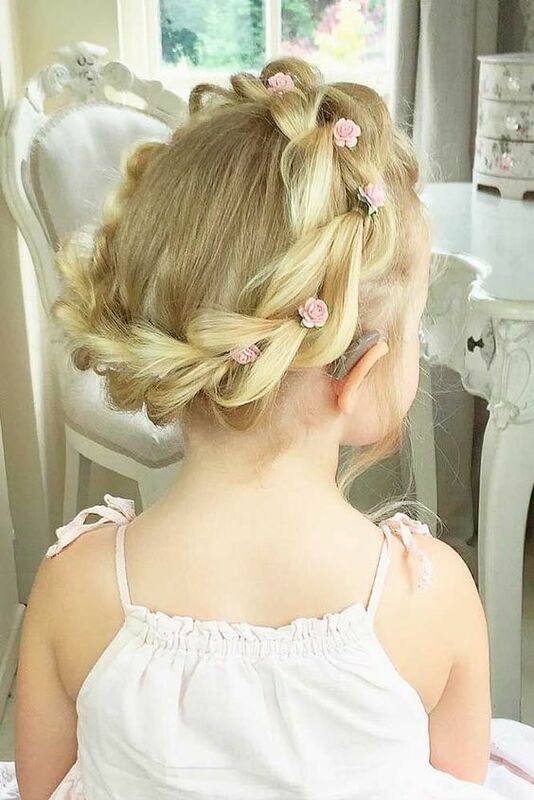 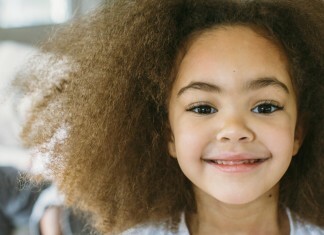 A lot of us might be tempted to try on grown-up hairstyles on our little girls – with the big hair, poofs, and huge curls, but going age-appropriate might be the best choice.